These chokes are based on iron powder toroidal cores from Micrometals 26 material. Because of their distributed air gap they have only little inductance dependence on DC magnetization and they can be used e.g. as the switch-source filtering chokes with work frequencies up to hundreds kHz. They also good approve as working chokes of switch-source with work frequencies of tens kHz. 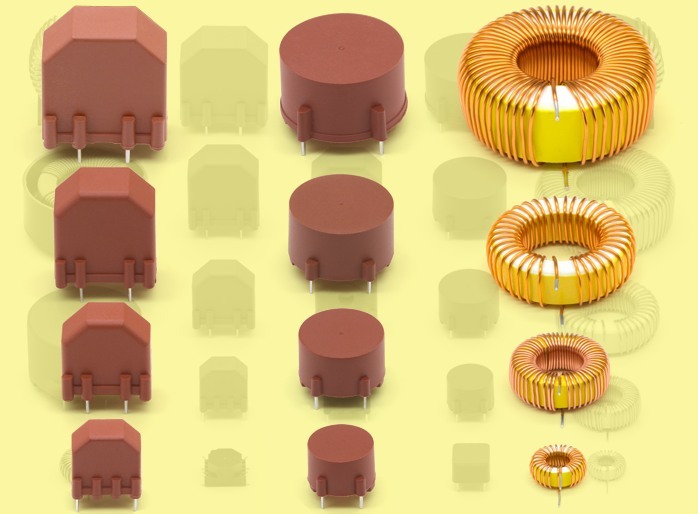 Because of their higher saturation and inductance increase above nominal value by AC magnetization, they are used like differential mode noise suppression chokes in circuits with triacs and thyristors. Twin chokes can be used like a space save solution instead of two simple chokes. In our standard offer are one-layer simple chokes in open or case version. On request we can deliver chokes according to customer requirements. Drawing of /Ve, /Ver, /Vi, /Vir, /H, /Hr, /SV3, /SV3r, SV4 and SV4r model from below.